A redesign to the Solid Rocket Booster (SRB) Thrust Vector Control (TVC) Auxiliary Power Unit (APU) fuel pump will be implemented on STS-134 and STS-133 – currently the final two “scheduled” shuttle flights. The redesign will eliminate the highest – although extremely unlikely to occur – “critical 1” failure scenario, which holds the potential of a LOV/C (Loss of Vehicle/Crew) event. There are two self-contained, independent HPUs (Hydraulic Power Units) on each SRB. Each HPU consists of an Auxiliary Power Unit (APU), Fuel Supply Module (FSM), hydraulic pump, hydraulic reservoir and hydraulic fluid manifold assembly. The HPU components are mounted on the aft skirt between the rock and tilt actuators – which are part of the Thrust Vector Control system that drives the SRB nozzle to aid the steering of the stack during first stage ascent. The APUs and their fuel systems are isolated from each other, with each FSM (tank) containing 22 pounds of hydrazine. The fuel tank is pressurized with gaseous nitrogen at 400 psi, which provides the force to expel (positive expulsion) the fuel from the tank to the fuel distribution line, maintaining a positive fuel supply to the APU throughout its operation. Fuel flows primarily through the startup bypass line until the APU speed is such that the fuel pump outlet pressure is greater than the bypass line – then all the fuel is supplied via the fuel pump. The APU turbine assembly provides mechanical power to the APU gearbox, which drives the APU fuel pump, hydraulic pump and lube oil pump. The turbine exhaust of each APU flows over the exterior of the gas generator, cooling it, and is then directed overboard through an exhaust duct. Each HPU on an SRB is connected to both servoactuators on that SRB. One HPU serves as the primary hydraulic source for the servoactuator, and the other HPU serves as the secondary hydraulics for the servoactuator. The APU 100-percent speed corresponds to 72,000 rpm, 110-percent to 79,200 rpm, and 112-percent to 80,640 rpm. In summary, the two TVC systems (rock, tilt) per SRB that control the SRB nozzle employ a hydrazine fueled APU to generate the power required to drive the hydraulic supply pump. The APUs/HPUs and hydraulic systems are reusable for 20 missions. No safety concern has arisen to cause the change to the APU fuel pump, rather this is another example of continued improvements that are made to the hardware during almost every mission cycle. 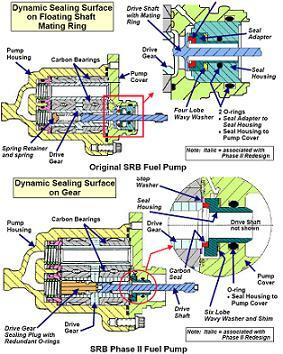 The change to the fuel pump relates to the small potential that a carbon seal may be lost/compromised during operation, allowing for two metal surfaces to contact – which would become an ignition source. This change was proposed and approved by the all-powerful Program Requirements Control Board (PRCB). “Fuel pump redesign eliminates Criticality 1 failure scenario: Loss of drive shaft carbon seal results in metal on metal contact leading to fire or explosion, loss of APU with possible loss of mission under worst case conditions. Represents highest SRB risk per current Shuttle Probability Risk Assessment (PRA),” noted the expansive PRCB presentation, available on L2. To remove the threat, the APU will follow a design route used on the orbiter’s APU fuel pump, sealing the surface between the drive gear and a static carbon seal. “Fuel pump design comparison: Original fuel pump utilized dynamic sealing surface on floating shaft mating ring. 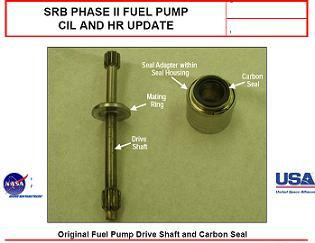 Carbon seal mated with rotating drive shaft,” added the presentation. The change to the Phase II fuel pump will be tested on STS-134 via just the Right Hand booster’s tilt system, before being implemented on all four fuel pumps on STS-133 – currently the final flight of the shuttle. “First flight STS-134/BI144 in RH tilt system (one pump). 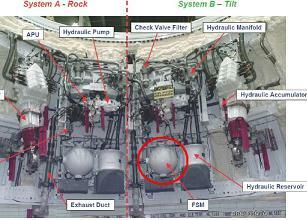 STS-133/BI145 utilizes Phase II fuel pumps in all four locations,” the presentation confirmed, showing how the shuttle contractors are aiming to include improvements all the way to the final flight of the fleet, pending a potential extension of the manifest. The presentation also listed the large amount of testing – and Structural Analysis at Hamilton Sundstrand – that has taken place prior to the change of design’s certification for flight, along with the confirmation of the decrease in risk to the system. “Phase II fuel pump basis for certification: Test, Analysis and Similarity: All requirements of certification plan addressed through functional and vibration testing, analysis, and tear-down inspections. “Conclusion: Test and analysis show SRB Phase II Fuel Pump safe to fly and reduces overall SRB risk by eliminating one Criticality 1 failure scenario. 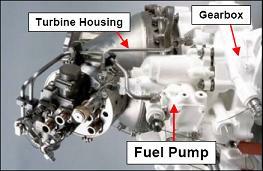 “Created eight new (certification) documents for Phase II fuel pump: New documents needed due to new part number. No new failure modes introduced. Decrease in risk identified. The change in design would have been implemented on the Ares I First Stage – a single booster – and the Ares V twin SRBs, prior to both vehicles being cancelled by the FY2011 budget proposal.